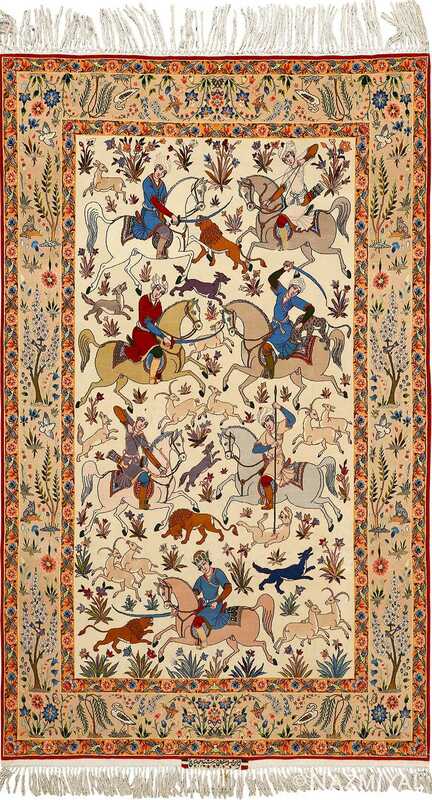 Hunting Scene Rugs – The tradition of hunting is deeply immersed within Persian epic history. 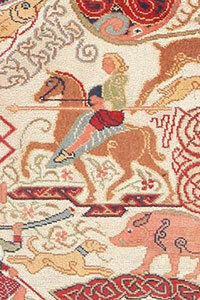 Years before the first hunting scene rug was ever woven, hunting stories were passed down orally for over 1300 years. 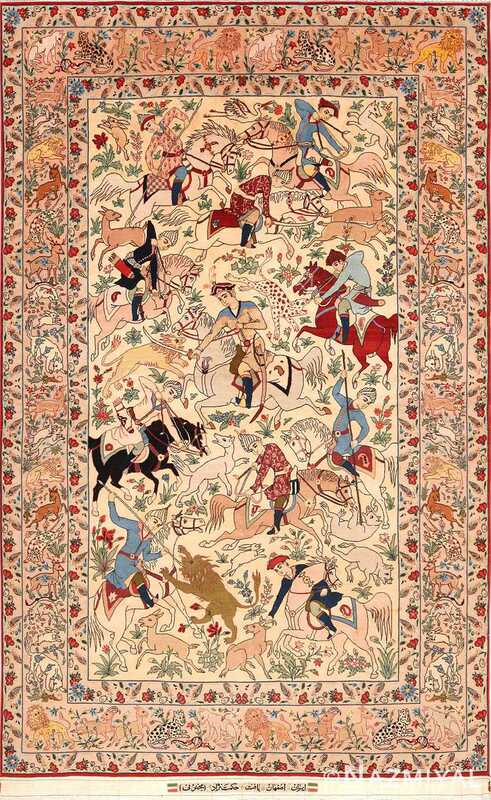 Because this practice was so deeply embedded in Persian culture, it is no surprise that weavers portrayed hunting scenes in their work as early as the 16th century. These hunting designs show no specific city they do not directly refer to any particular person or historical event. In the rare case when a specific individual is depicted, he is distinguished by his manner of dress or an inscription within the antique rug. 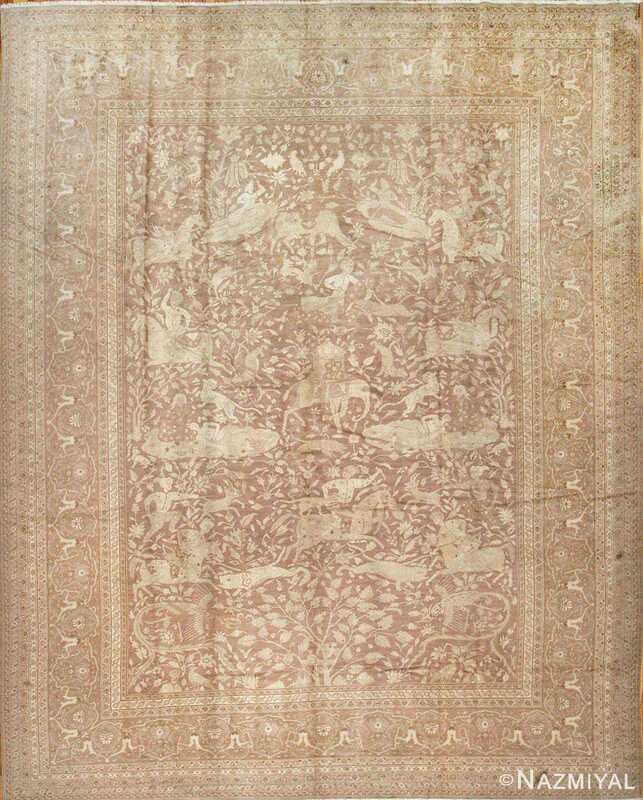 Because hunting was considered such a distinguished act, these carpets represent a part of princely life. 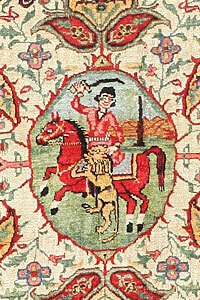 Furthermore, many hunting scene rugs were originally commissioned for nobility and royalty. This specific Tabriz rug, woven in Azerbaijan circa 1880, has an extremely artistic design that elevates this piece from an ordinary rug to an exquisite work of art. Upon close examination, one can see that so much time and effort went into executing such a marvelous motif. 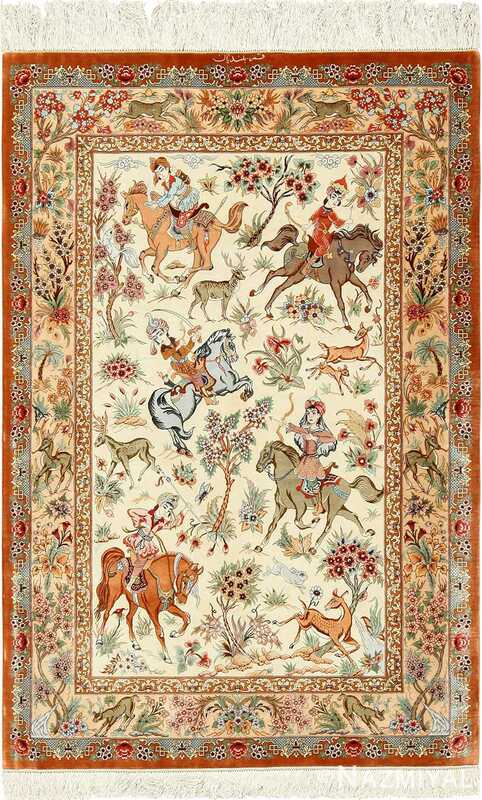 This hunting scene rug features an asymmetrical design that spans the whole field with a great sense of movement. 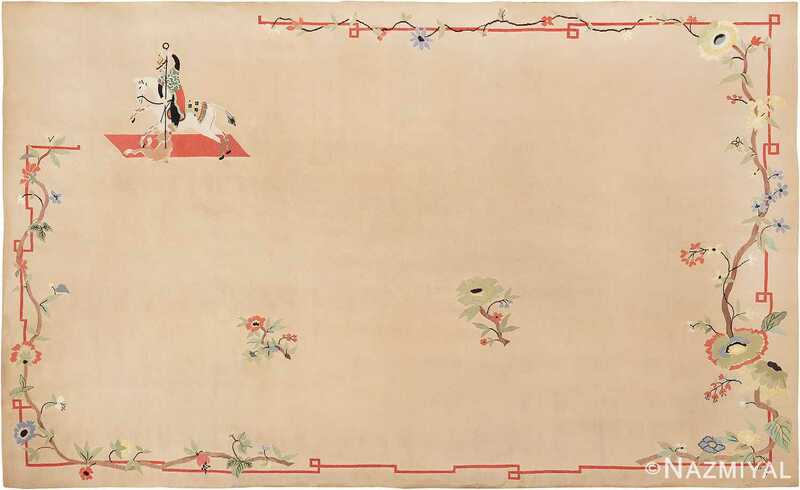 Usually, the objects in pictorial antique rugs seem very stationary, as if the subjects were posing motionless. However, this master weaver has achieved something that is rarely seen – he was able to capture not only the characters, but also the passion that drives them. Every scene flows into the next so fluidly, it is hard to tell where one ends and the other begins. 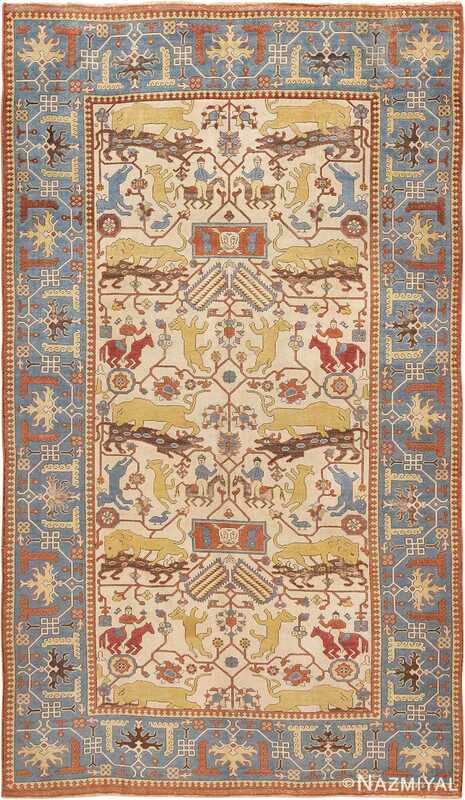 Framing the majestic field, the animal design carries into the border, bringing an overall continuity to the rug. 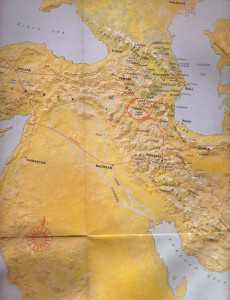 The story of Tabriz is one of repeated destruction, survival, restoration and revival. In 791 A.D., it was rebuilt after a devastating earthquake. It rose again after earthquakes in 858, 1041, 1721 and 1780 A.D. It survived the invasion of the moguls, the Ottomans the Afghans and two Russian occupations, one in 1827, and the other under Stalin’s regime in 1941. 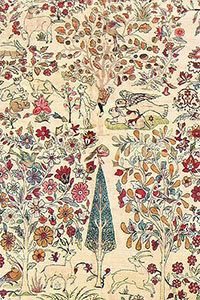 Some of the most artistic expressions of the sixteenth century Persian craft were produced in Tabriz. However, from the time of the Afghan invasions in 1722 until the late 19th century, the karkhounes (workshops) ceased to exist and the craft returned to the level of the village weaver making no more than sufficient for his own needs. 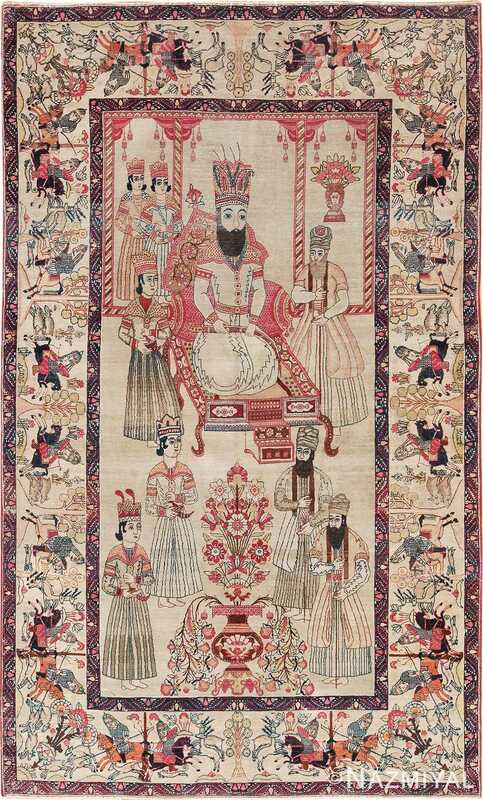 At the end of the 19th century, three inspired Persian master weavers, Haji Jalili, Sheik Safi and Kurban Dai were the flames of the revival sparked by an ever-increasing demand from western markets. 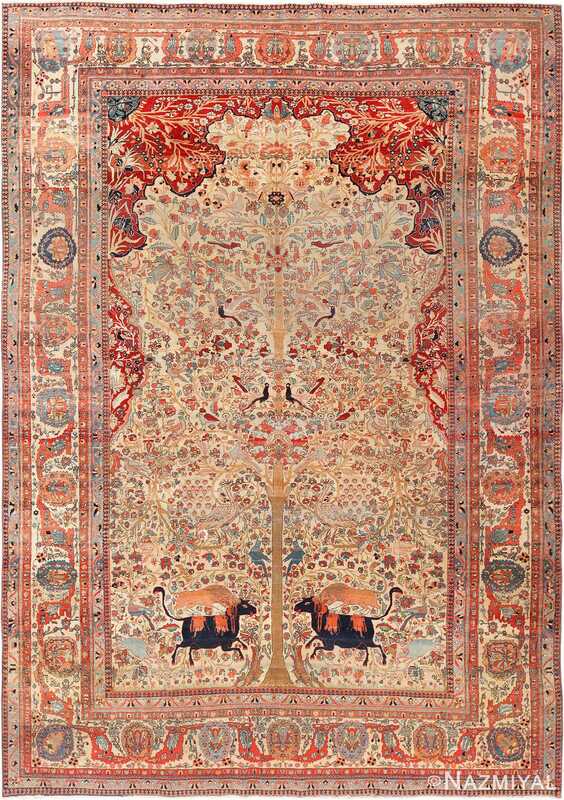 Tabriz carpets very diversified in weave and design, including the corner medallion design, palmette flowers, weeping willow, cypress tree, geometrical patterns, prayer-niche and hunting scene designs. 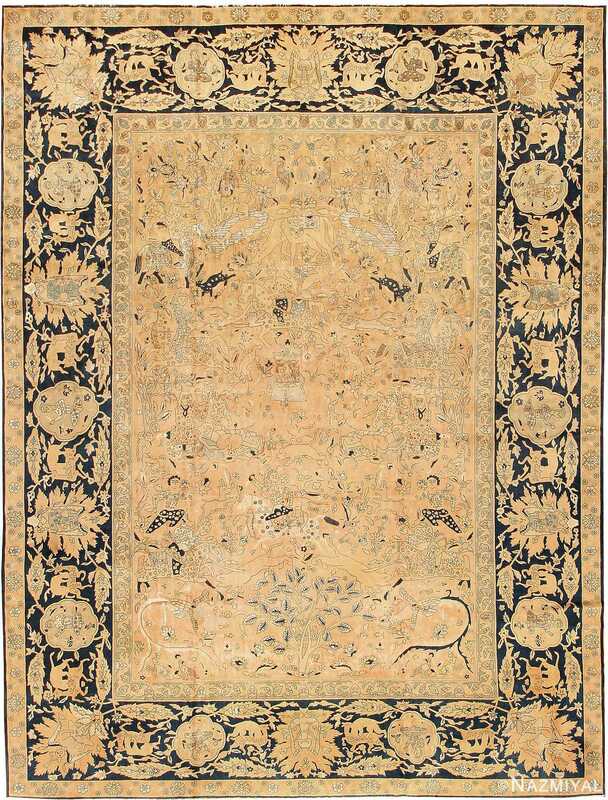 Pictorial Tabriz rugs are also very well known. 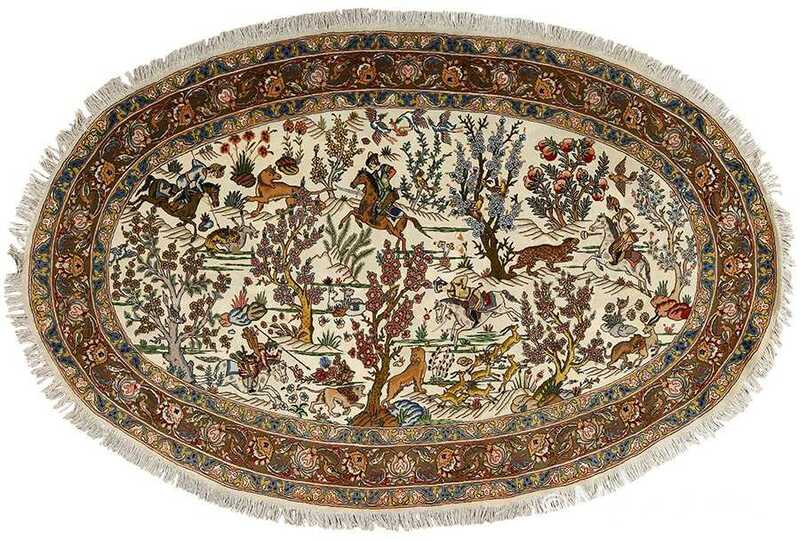 Some Tabriz carpets are decorated with imaginary motifs as well as Persian poetry. 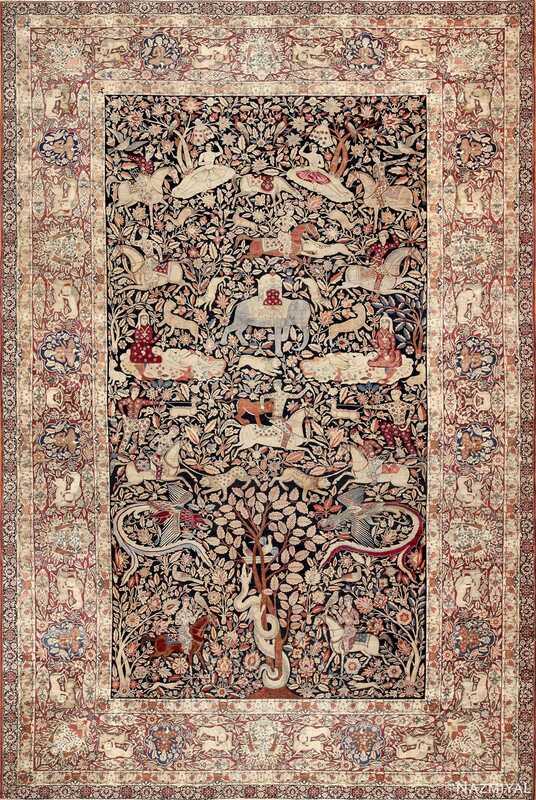 Antique Rug Symbols: Hunters and Archers — Hunting holds a large amount of cultural significance in Persia. For more than a millennia, stories about hunting have been passed down orally from generation to generation in Persian society. 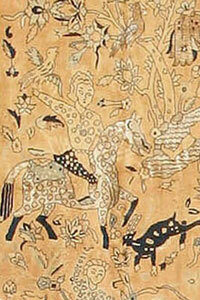 It is no wonder, then, that hunting motifs were some of the first to find their way into Persian rugs. 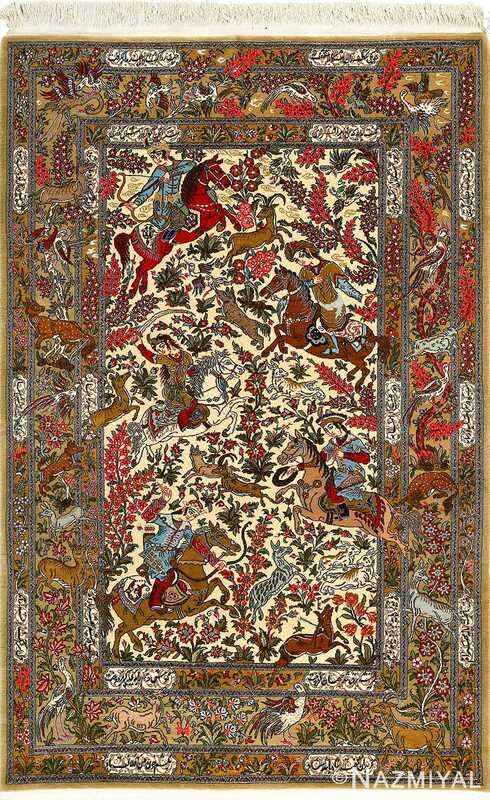 The first Persian hunting scenes rugs were made for the Shah and other members of the nobility to display in their lavish homes. 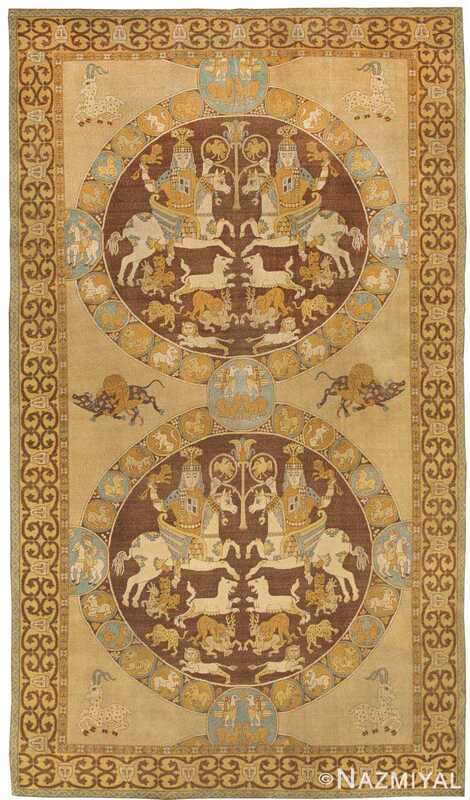 The oldest rug known to feature a hunting scene was found to have been originally owned by royalty, having been uncovered in a Scythian prince’s tomb. 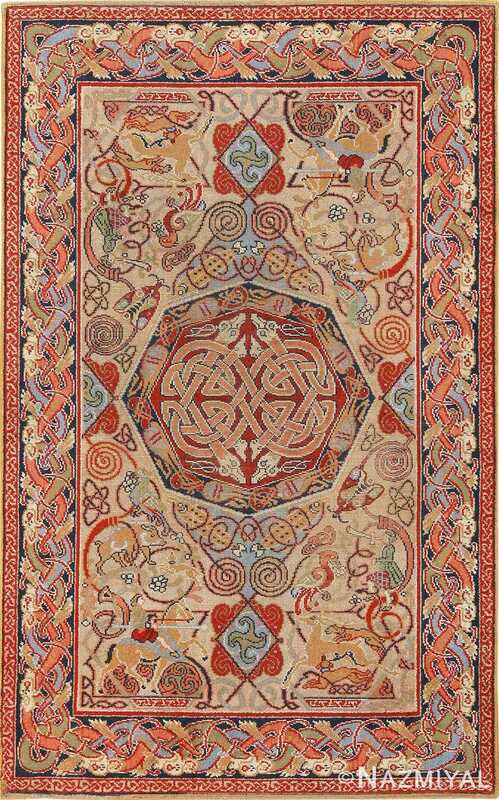 This is actually the oldest rug in the world and called the Pazyryk carpet, which is estimated to have been woven in 500 BC. 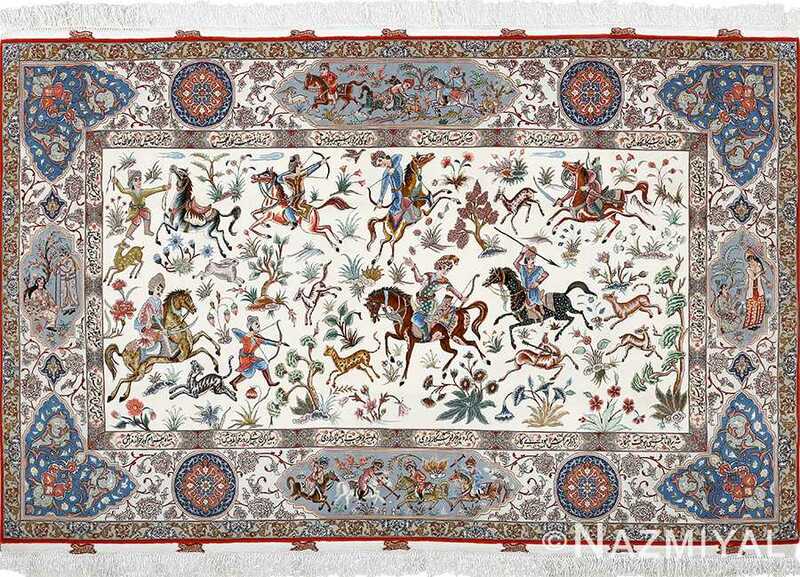 Aside from being the first known rug to feature a hunting scene, the Pazyryk rug is the oldest pile-woven rug ever discovered, suggesting that hunting motifs may very well have existed since this weaving style’s inception. 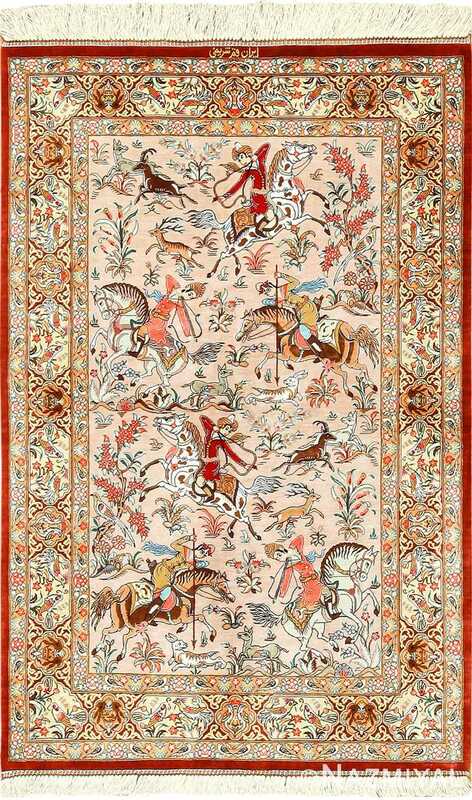 Despite the hunting motif’s early appearance in the designs of Persian rugs, designs of this kind all but disappeared in Persian weaving from 500 BC until the 16th century. Scholars believe that this may have been due to the increasing influence of various Islamic empires, which often viewed depictions of hunting and animals as a form of idolatry. 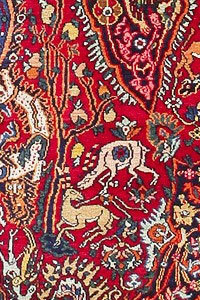 In the 1500’s, hunting motifs reappeared in weaving as a direct result of Safavid rule. It was at this point that Persian royalty again took part in the ancient tradition of commissioning weavers to depict hunting scenes. Symbolically, hunting represented skill, bravery, and masculinity and was often directly associated specifically with nobility and the Persian royalty. 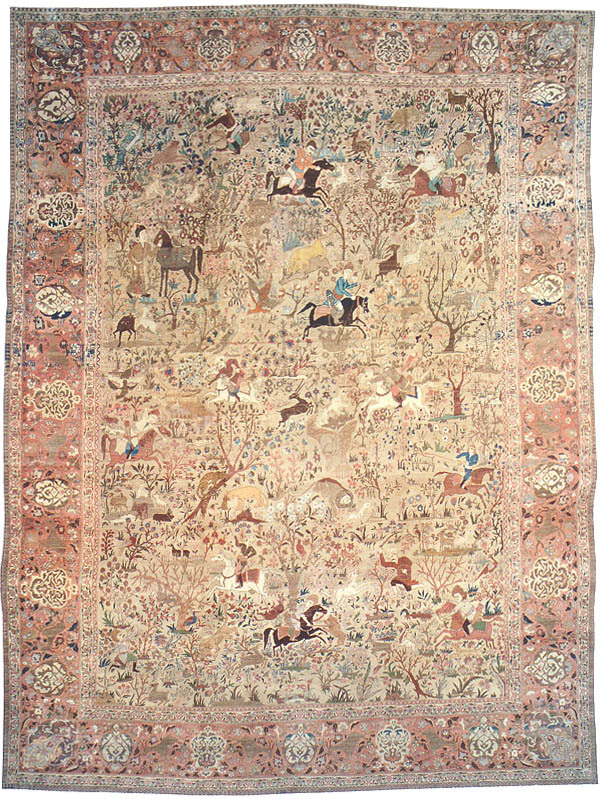 For this reason, the majority of antique rugs depicting hunting scenes were created for royalty and were often made with more expensive materials like silk. They often feature very fine details and an attention to realism.